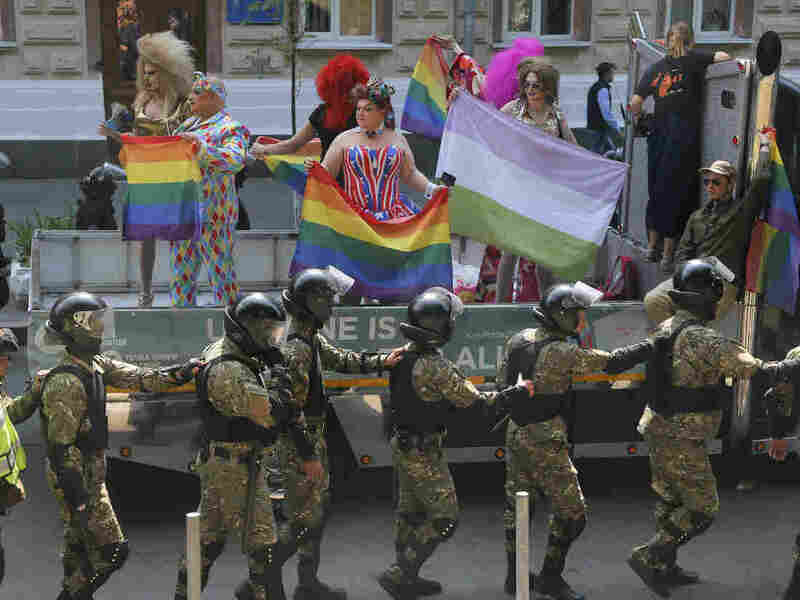 Organizer Says Pride Parade In Kiev More Of A 'Celebration' This Year : The Two-Way In the Ukranian capital Kiev's pride parade Sunday, a heavy police presence protected the marchers suppporting LGBT rights. In previous years the event has often been marred by violence. A heavy police presence guarded supporters of LGBT rights at the gay pride parade in Kiev on Sunday. In previous years, violence has broken out between pride supporters and far-right protesters. The annual Gay Pride parade is in just its fourth year in Kiev, and has twice been marred by violence. In 2015, clashes broke out between the pride supporters and protesters from far-right groups, who threw flares and injured two police officers. This year, the parade was flanked by a heavy police presence in riot gear. Despite a small group of protesters at the start, the parade was able to continue safely. Maxim Eristavi was one of the volunteers who helped organize KyivPride2017, and he says the mood was much lighter and less fearful than it has been in the past. "This time I think the majority, for the first time ever, were able to feel joy and pride and have kind of a celebration," Eristavi said. He added that he wouldn't compare it to Pride events in the U.S. or western Europe, but, "this was the closest Ukraine has ever gotten." The change in mood at the parade reflects some larger shifts in the country, as Ukraine's government moves to align itself more closely with Western Europe and further from Russia. "This kind of march wouldn't be happening in Russia today. Following the recent events in Chechnya with the abuse of gay men, this definitely shows that Ukraine is moving in another direction," said Natalie Vikhrov, a journalist in Kiev, said in a telephone interview. "This is more than just pride," he said. "This is a big political event for so many countries in the region that is trying to escape the colonial orbit of Russia, and move back to the European family." Eristavi added that the protection the parade saw from law enforcement is also a sign of progress for the country. "Even for regular Ukrainians who don't understand the equality battle, or the concept of queer rights," he said. "To see that in such a tense environment law enforcement was able to perform on such a high level, it's a good symbol of developing reforms in the country." Still, he emphasized that many people continue to face discrimination and persecution for their sexual orientation throughout the region. "Eastern Europe is a horrible place to be a queer person," Eristavi said. "This is by far the biggest pride event in the eastern European history. Seeing such a big crowd... it's a very good day for eastern Europe in general."